Galvanizers Association of Australia (GAA) comprises many of the leading galvanizing companies throughout Australia, New Zealand and Asia. GAA is an industry Association established in 1963 to represent galvanizing companies and to provide technical consulting services on a not for profit basis. The Association’s objectives are to provide the highest standards in design and quality of galvanized products and to assist consumers achieve the economics inherent in the correct design and application of galvanized products. We provide free technical publications and practical assistance on all aspects of design, application, process, bolting, welding and painting of galvanized steel. This site is designed to assist designers, specifiers, materials engineers, consultants, and fabricators to protect and improve their steel products. 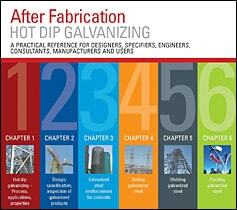 Important aspects of the galvanizing process and the properties and applications of galvanized coatings are covered. Sections detail the design and specification of galvanized steel, fabrication methods including bolting and welding, and the painting of galvanized steel. Great effort has been made to make this site accurate and up-to-date, but responsibility is not accepted for any loss, damage or other consequence resulting from its use.